2,873,331 specimen records and 1,366,125 images from 40 herbaria. Search for herbarium specimens by label data or geographic location. Results show full label data, images of specimens sheets, and a distribution map. Results can also be downloaded or distilled into a species checklist. Create species lists for any counties in Washington, Oregon, Idaho, or Montana. Lists can include vascular plants, bryophytes, lichens, algae, and/or fungi. 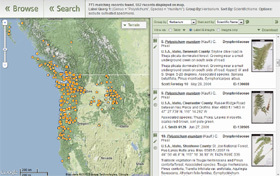 Collection dot maps for the region, and maps showing geographic coverage by herbarium for ID, MT, OR, and WA. A comprehensive list of documents and links relevant to digitizing biological collections, particularly herbarium specimens. Maintained by the Consortium of Northeast Herbaria.